In .net world you can choose your language and write your application with best language which matches your requirements. Different languages has different paradigm. For example C# started with static/strongly type paragoge but over years it has been evolved and now it does support functional programming as well as dynamic. There are many other languages like F#, Visual Basic and fortran. It is compiler responsibility to generate assembly with proper intermediate language so that CLR (Common Language Runtime) would be able to generate native code (using JIT) and run at run time. Each compilers support subset if intermediate language and provide its flavour using syntactic sugars in the language. CLR allows language integration as long as written code comply with Common Language Specification. It means because of differences between languages, if you want to use types generated by other languages, you need to use certain feature of language that are guaranteed to be available in other languages. 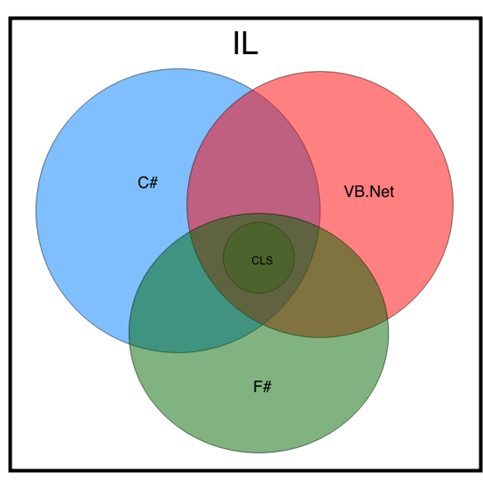 CLS is the lowest common denominator of language features provided by Microsoft. However, today I don’t want to highlight CLS, instead I want to mentions that Intermediate Language in some cases has more features which languages like C# didn’t bother to implement. As you might have noticed there is no C# equivalent for family or assembly although IL has this keyword. there is not such a thing in VB.Net as well. Now lets have a closer look on a simple sample and generated IL code. Assume we have two simple project in a solution. A Console Application and a Class Library which console application referenced that. In the Class Library we have a simple class called Super and in console application, beside Program class we have a class derived from Super class called Sub. Lets have a look on their codes. Cool, now let mess around with the IL and see that would happen if we change that. lication.Sub.Bar()' to access method 'ClassLibrary.Super.Foo()' failed. famandassem means that only derived class within same assembly will have access to that member. Just for the sake of testing lets Super to the ConsoleApplication and see if it works. Now open ConsoleApplication.il and paste this code at the end after end of Class ConsoleApplication.Sub. We need to do one more thing and get rid off reference to ClassLibrary.il which we don’t need anymore. So right in the beginning there is some code for that. Delete that piece of code and save the file. One more thing to do and it is replacing all [ClassLibrary] with empty string. Now we have new ConsoleApplication which doesn’t have reference to ClassLibrary. Run ConsoleApplication.exe you see it runs successfully.